I’ve been meaning to write a blog post about the research undertaken in the Netherlands which concluded that most people replace half of their friends every 7 years. It was brought to my attention by a couple of on-line friends – Jordi Robert-Ribes and Ben Wirtz – who both happened to raise it when we met up in the real-world for the first time. Maybe they were both hinting there was only a 50:50 chance we would still be in contact in 7 years … or less! The research came out of a project in Holland called “Where friends are made. Context, Contacts, Consequences,” and was set up by Beate Völker. Beate doesn’t seem that keen on connecting – she has one of those Twitter accounts with protected Tweets! The actual research was run by Sociologist Gerald Mollenhorst of Utrecht University (not on Twitter at all!). It always baffles me when Sociologists/Anthropolgies/academics don’t “come out to play” in the world of social media. Mollenhorst conducted a survey of 1,007 people aged from 18 to 65. He contacted them twice – with a 7 year gap in between. From the original group, 604 people answered on both occasions. The survey contained questions such as: Who do you talk with, regarding personal issues? Who helps you with DIY in your home? Who do you pop by to see? Where did you get to know that person? And where do you meet that person now? The results showed that personal network sizes seemed to remained stable, but that many members of the network were new. About 30 percent of discussion partners and practical helpers had the same position in a typical person’s Personal Network seven years later. The big finding was that only 48 percent of the original contacts were still part of the network. 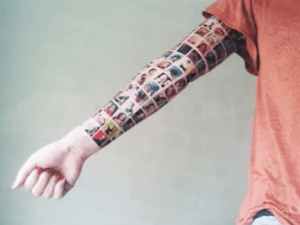 I have thought for a while that this was interesting research – and it became more relevant after I saw the video of a lady – Suzy (also from the Netherlands) – making a permanent record of her 152 Facebook Friends in the form of a tattoo! Currently the video has been watched by over 300,000 people. It’s not getting as many likes as dislikes – as I write the score is 511 likes to 1,018 dislikes. Let’s hope that there are not too many of her friends in the disklikes. Well, Suzy is on-target with the work of Robin Dunbar. She’s bang on with 152 friends and his Dunbar Number of 150. However, she might have also given some thought to the work of her fellow Netherlander Gerald Mollenhorst. She’s in for a lot more than a 7 year itch! I wish I’d written down who I was connected with 7 years ago. This is a fascinating bit of research I’d love to find some personal application for. Let’s see . . . Monday, June 13th, 2017 . . . yes, it looks like I’m free for lunch. Casablanca would be fun, or perhaps Ulaan Baator? Once again, I’m reminded why I have Sue manage my schedule. We’d be meeting a year early. We’ll have to shift it to Wednesday (my favorite day) June 13th, 2018, if we’re to get 7 years out of it. We might even consult them as to venue, eh? Might even invite them to come!